TMD refers to temporomandibular joint disorder, sometimes referred to as TMJ, for the temporomandibular joint. TMD refers to a number of problems related to this jaw joint, its musculature, and related structures. TMJ refers to the hinge joint itself. 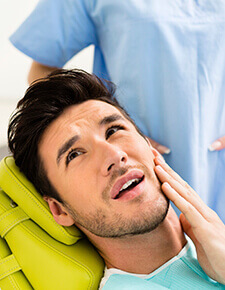 TMD problems can be extremely painful and cause normal function to be difficult or impossible. Treatment of TMD is often multifaceted. Proper diagnosis is essential. Dr. Sierra would be happy to help you with TMD and discuss treatment at length. Contact our team to schedule a TMD consultation. Patients who notice any of the following symptoms should let our team know right away. In most cases, our goal will be to help patients comfortably realign their jaw to diminish associated discomfort. This can be achieved by a number of methods including physical therapy, surgical readjustments, and orthodontic treatment. Possibly the easiest way to improve overall comfort quickly is to wear an occlusal splint during sleep. While we’re awake, it’s easy to stop ourselves from engaging in jaw usage that is painful, but at night, we may be doing untold damage to our TMJ without ever knowing it. Occlusal splints worn during sleep comfortably reposition the jaw allowing patients to rest easily through the night and preventing excessive strain or pressure on the jaw. We custom craft these occlusal splints to meet each patients’ unique needs allowing them to speak, drink, and breathe easily while wearing their splint.